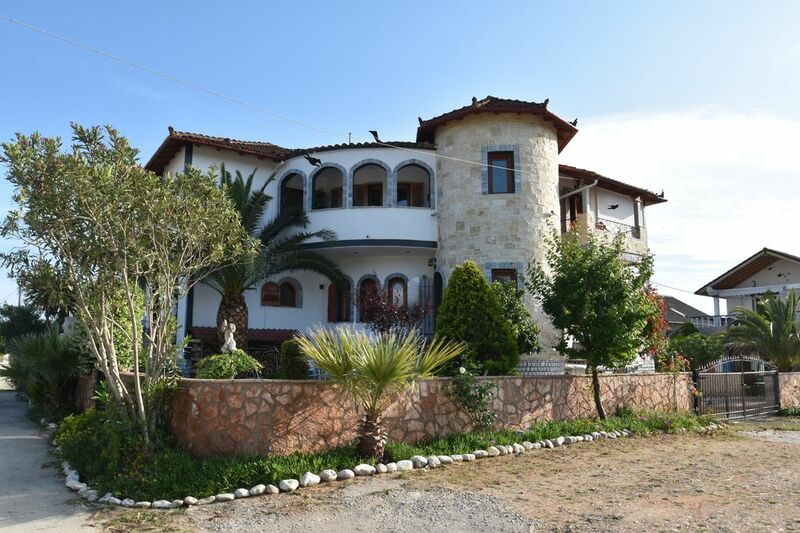 Large apartment with two separate bedrooms, living room, dining room with kitchen, large sun terrace for breakfast and an extra balcony in front of each bedroom. Very good equipment with carpets, leather furniture, air conditioning, satellite TV with all European programs. All things for daily needs from a 'thimble to a bottle opener' are available. BBQ facility outside. Excursions on the mainland and on the water are offered. For divers, there are three complete sets of equipments and diving compressors. Our complex is located in a very peaceful location about 300 m from uncrowded beaches. The centre of the city by the Acheron River is just a few minutes away on foot. Here you will find taverns with Greek and international cuisine, and 3 supermarkets. For those who arrive by car, there are a lot of other beaches nearby. If you arrive by airplane, we can provide you with one of our cars. This and a lot more in a comfortable, familiar atmosphere. Arrival options: By airplane to Corfu, then with the ferry (about 60 min) to Igoumenitsa where we will meet you at the harbour. Or if you arrive by airplane in Preveza, we will greet you directly at the airport or by car to Triest, Venice, Ancona or Bari, then with the ferry to Igoumenitsa, then it just about 50 km to Ammoudia. Sports and hiking: During the spring and fall, hikes in the flatland and in the nearby mountains are performed, some with overnight stays in lodges. Starting in May, we drive with our boat to the Gulf where we guarantee that you will meet dolphins. Directly in front of the house is a volleyball court (sand) that is only used by our house-guests. Cycling tours are offered. Water sports: Diving with the boat, compressors available. Water skiing and sailing (Jolle 420), skipper training with the sailing yacht Vichor, 33 feet, motor yacht for island hopping 6 places to sleep, 35 feet. Pool party with live music on request and a lot more. Sophisticated standard. Every morning the baker comes to the house. Every second day the greengrocer. Breakfast options nearby. Supermarket with a good assortment and multiple restaurants by the sea and by the Acheron River. Internet connection (flat rate). Possibility for sailing on catamaran. Tja. Wie fange ich am Besten an, ohne dabei von meiner Euphorie mitgerissen zu werden? Also wir waren zu dritt und mit den Motorrädern in Ammoudia. Nachdem ich nicht selbst gebucht hatte, und doch schon mehrmals in Greece war, habe ich DAS nicht erwartet. Als wir angekommen sind, haben uns Birgit und Uwe freundlich begrüsst, als wären wir schon langjährige Bekannte. Noch etwas skeptisch (und müde vom biken) haben wir das Appartement bezogen, daß mich im ersten Augenblick mal ziemlich "umgehaut" hat. Ich hatte -ehrlichgesagt- kein Appartement dieser Wahnsinnsquqlität erwartet. Fernseher (den wir nicht brauchten), Riesenterrasse, Sonnensegel, Mikrowellenherd, etc. Alles vorhanden, was man sich nur vorstellen kann. Dann der Umgang miteinander:Da wir von Natur aus skeptisch sind,waren wir anfangs sehr zurückhaltend.Aber nach 2 Tagen war es, als gehörten wir zur Familie. Uwes Motto:"Respekt vor jedem Menschen" und die Art:"Ihr seit hier auf Urlaub, also schauen wir gemeinsam, daß ihr eine tolle Zeit habt", haben mich restlos überzeugt. Ich hatte einige sehr tolle Urlaube, aber Jene, die ich als "perfekt" bezeichnen würde sind sehr rar - dieser gehört allerdings dazu. Ich kann die Unterkunft jedem empfehlen, der freundlichen, respektvollen und zuvorkommenden Umgang schätzt. Auch mit Kindern ist es dort kein Problem-Obwohl ich selbst nicht der grosse Kinderfan bin, muss ich sagen, daß die Kinder der Gäste dort überhaupt kein Problem waren. Die 300 m zum Strand sind zu Fuss supereinfach zu finde (man braucht KEIN Navi), und der Strand selbst ist wunderschön. Sehenswürdigkeiten gibt es auch eine Handvoll, aber ich empfehle Uwe als "Fremdenführer" zu engagieren, da erst seine Erzähungen "Steinehaufen" zu einem echten Erlebnis machen. Auch ist es möglich Tagesausflüge zu machen. Ich hoffe, die Kritik war sachlich genug und hatte nicht zusehr den Touch eines Lobliedes, aber ich gebe wirklich nur wider, was Urlaub bei Birgit und Uwe so speziell macht. Und ich freue mich schon darauf, sie wieder besuchen zu dürfen. ......we have just spent two weeks in the delightful company of Uwe and Birgit at their lovely apartments. The resort of Ammoudia is perfect for families and couples alike, with clean, warm seas; a gorgeous beach and idyllic scenery. The Aspri Villas are a great place to enhance the holiday further, situated with stunning views just minutes from the beach. The pool and grounds are well kept, and our hosts help you to get more from the holiday, organising memorable trips (the dolphin trip was fabulous) and ensuring all their guests feel looked after. The village has a simple Greek atmosphere, with many traditional restaurants and not a British pub in sight! We enjoyed strolling around the village, and surrounding hills; as well as along the river. All in all, one of our best holidays, and my only hesitation in recommending it to everyone I know is the fear of spoiling it! Pre svega bi zeleli da se zahvalimo domacinima na divno provedenom odmoru. I da nam oproste sto kasnimo sa pisanjem utisaka. Uwe, izvini. Ovo je mesto koje je apsolutno idealno za porodicni odmor. Mesto je toliko mirno da je to jednostavno nemoguce opisati. Bez ikakve buke, verujte nam na rec. Vila je apsolutno predivna, sto mozete videti na slikama. Ima vise apartmana nego sto se vidi u ponudi. U glavnoj zgradi imaju tri apartmana, jedan u prizemlju i dva na II spratu koji dele veliku terasu sa pogledom na bazen. Slike su malo isprepletane, ali kada posaljete upit za apartman, Uwe ce vam sve objasniti i poslace vam konkretne slike apartmana. Mi smo bili u apartmanu na II spratu, gledano frontalno na slikama, sa desne strane vile do bazena. Smestaj je apsolutno fantastican, imate kuhinju sa trpezarijom, dnevnu sobu sa svom neophodnom tehnikom, satelitskom televizijom, audio sistemom itd, dve spavace sobe, kupatilo sa tus kabinom i cak 3 terase ! Najveca gleda na dvoriste i bazen, i naravno na more. Pogled je divan, zaista. Jos dve terase su vezane jedna za decju i jedna za dnevnu sobu. Ormana ima dovoljno za smestaj stvari, a u kuhinji ima gomila aparata za sve i svasta. Ako vam nesto zatreba a slucajno nema, pitajte Uwe-a i on ce vam to nabaviti. Za smestaj sve pohvale, jedan od najprostanijih smestaja u kojima smo bili. U dvoristu se nalaze jos dve kuce sa apartmanima, jednu od njih su potpuno zavrsavali kada smo mi dosli prosle godine. Postoji lep i funkcionalan rostilj (rostiljali) u dvoristu. Bazen nije velik, ali je dovoljan za klince i naravno da se bucnete i rashladite na vrucini ako niste slucajno otisli na plazu. Uwe svaki dan proverava stanje vode tako da nemate o cemu da brinete sto se tice bazena. A plaza...to je poseban prica. Plaza je stvorena za decu. Znaci na nekim mestima cak i do 50 metara je plicak, ali u prvih trideset je svuda.Sa toliko blagim padom da ne morate uopste da vodite racuna gde su deca, jer ne moze nista da im se dogodi. To naravno ne vazi za dane sa vetrom kada talasi mogu da budu jaki jer je otvoreno more. Plaza je od sitnog peska. Na nekoliko mesta imate kafice sa lezaljkama na plazi koji ce vam ih vrlo rado iznajmiti ako narucite dva pica i vase su ceo dan, cak i popodne kada se vratite, niko ne pravi problem. Ima puno kampera, koji su u sumici odmah uz plazu. Plaza je dovoljno velika i ako hocete da budete sami (ima i nudisticki deo). Restorana ima dovoljno na setalistu pored reke koje se uliva u more. ZA PRAVI ODMOR. Sehr schöne Wohnung und Vermieter super freundlich!! Eine sehr schöne Umgebung bei der man sich rundherum wohlfühlen kann. Ammoudia, a fishing village at the mouth of the Acheron River has not yet been overcome by mass tourism. Crystal-clear water distinguishes our crescent bay. The shore is shallow, there are no rocks or sea urchins in the bay. In the background of the village is a great mountain panorama from the Acheron Mountains. Diving, water skiing and skipper training for sailboats and motorboats, along with everything that has to do with water sports. Hiking: hiking possibilities possible nearby, but also hikes during multiple days are possible without knowledge of the surroundings. Running, jogging or other fitness activities are offered in the spring and fall. Cycling: A paradise for cyclists! Far from crowded streets we offer our guests training tours of all difficulties. Paragliding: Paragliders are brought to the starting place with the bus and also picked up from the landing area (shuttle service). Those who want 'pure' Greece are perfect here!